Richard Ewart Andrew was born in Yeovil in the autumn of 1898. He was the son of General Merchant's Clerk James Richard Andrew (b 1868) and his wife Ada Eliza née Farrant (1897-1937). In the 1901 census James and Ada were recorded at 11 Colmer Road with their five-year old daughter Hilda and two-year old Richard. The family were still there in 1911. Richard later worked at Yeovil solicitors Watts, Watts & Henley prior to enlisting. In February 1917 Richard enlisted at Taunton and became Private Richard Andrew (Service No 41679) of 8th (Service) Battalion, Royal Inniskilling Fusiliers. The 8th (Service) Battalion had been formed at Omagh as part of the Second New Army and then moved to Tipperary and joined the 49th Brigade of the 16th Division. The 16th (Irish) Division, which included the 8th Inniskillings, served in France and Flanders, fighting with great gallantry, and suffering terrible casualties, in many campaigns from the Somme in 1916 until the end of the war. Towards the end of June 1917 Richard was sent to France and by August was in the front line. In the Third Battle of Ypres an offensive was mounted by Commonwealth forces to divert German attention from a weakened French front further south. The initial attempt in June to dislodge the Germans from the Messines Ridge was a complete success, but the main assault north-eastward, which began at the end of July, quickly became a dogged struggle against determined opposition and the rapidly deteriorating weather. The Battle of Langemarck from 16–18 August 1917, in which the 8th Battalion, Royal Inniskilling Fusiliers - including Richard Andrew - took part, was the second Allied general attack of the Third Battle of Ypres during the First World War. The battle took place near Ypres in Belgian Flanders on the Western Front. The campaign finally came to a close in November with the capture of Passchendaele. Richard was killed in action on the first day of the battle, 16 August 1917. He was just 19 years of age. On 5 October 1917 the Western Gazette reported "Priv. RE Andrew, Inniskilling Fusiliers, only son of Mr and Mrs Andrew, Goldcroft, Yeovil, is reported missing in the fighting on August 16th last. Previous to joining up in February of this year he was engaged at Messrs. Watts, Watts & Henley’s, solicitors, Princes Street. He was 19 years of age, was sent to France at the end of June, and was in the fighting line a month later." 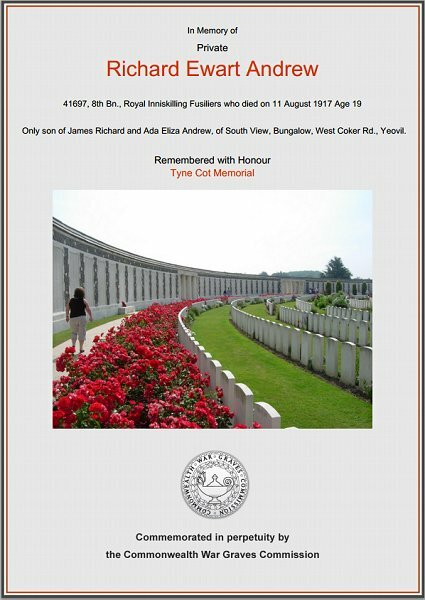 Richard Andrew is commemorated on Panels 70 to 72 of the Tyne Cot Memorial, Zonnebeke, West-Vlaanderen, Belgium and his name is inscribed on the War Memorial in the Borough. The Commonwealth War Graves Commission certificate in memory of Richard Andrew.